Last year while celebrating my bowhunting buddy's 75 birthday at his 35 acres in south central Texas we decided to hunt his place on his next birthday(Oct 19) this year.We got there on Friday in time for the afternoon hunt and I set up a small tripod overlooking a one acre oat patch. 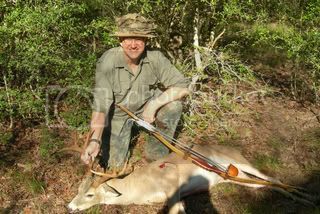 Had a spike and does come close and three bucks at 30 yards, with one being a 8 point at about 19" wide but no shot. Saturday morning I went to the back of his place where a 15" ladder stand was set up and I had never been in.It had rubs and one scrape within bow range of my stand and was a crossing for deer. I saw nothing until right before 8 AM and a doe came under me followed by the wide buck I had seen Friday. He lunged at her like he was in rut and walked under some brush when I drew and held until he was clear at about 15 yards.My 47# longbow hit high in the shoulder and came out low behind his leg.I saw the feathers disapear and after he ran 5 yards the shaft broke off in front of the feathers and fell to the ground. I waited about 45 minutes and went looking and blood was hard to see because of a heavy dew so I went to where I last watched his run and crawled under the brush until I came to a trail which I followed and by luck found him to the side of the trail. 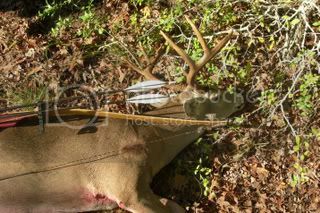 He was about 80 Yards from my stand. The wide 1 1/2" 210 grain Aboyer single bevel had done its job. The broadhead would still shave after I found it.This was a great hunt even though my buddy Don's birthday was not until Sunday.I am 69 now and he turned 76 years old. On his birthday the next morning he and were sitting outside the cabin and as I looked across the pond a Cougar(over 100#) ran across.In all my hunting I have never seen a mountain lion in the wild.He and his wife had seen one in the same place about 3 sighting in the last 3 years. Nice buck! Congrats on a great hunt. That is awesome! Like mentioned above, I hope I still have the flame burning like you do when I reach your age. Well done! Reads like a wonderful hunt and fellowship! !